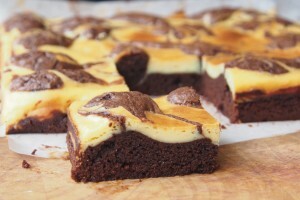 I am neither a chocolate nor cream cheese person but I was really attracted by the Cream Cheese Brownie recipes I saw on Pinterest. I kept searching till I found a couple of recipes. This is the second recipe that I tried. The first recipe from Martha Stewart turned out a bit dry though some people like this texture. This second recipe is adapted from Joy of Baking.com and it is moist, with more cream cheese. I reduced the sugar by about 40%. I also added cocoa powder and baking powder which is not used in original recipe. The sweetness turned out just perfect. 1. Preheat oven to 325 degrees F (160 degrees C) and place the rack in the center of the oven. Have ready a 9 inch (23 cm) square baking panthat has been lined with non stick baking sheet. 2. In a heatproof bowl, placed over a saucepan of simmering water, melt the butter and chocolate. Remove from heat and stir or whisk in the sugar and vanilla extract. Add the eggs, one at a time, beating well after each addition. Stir in the flour, cocoa powder, baking powder and salt and stir vigorously until the batter is smooth and glossy (about one minute). Remove 1/2 cup (120 ml) of the brownie batter and set it aside. Spread the remainder of the brownie batter evenly onto the bottom of the prepared pan. 3. Then, in the bowl of your stand mixer, beat the cream cheese just until smooth. Add the sugar, vanilla, and egg and beat just until creamy and smooth (do not over beat). 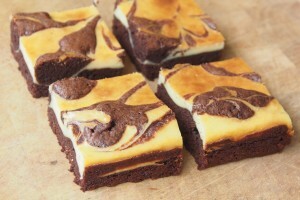 Spread the cream cheese filling evenly over the brownie layer. Spoon 16 small dollops (4 rows with 4 dollops of brownie batter in each row) of the reserved brownie batter evenly on top of the cream cheese filling. Run a knife or wooden skewer back and forth through the two batters until you have a marble effect. 5. Remove from oven and place on a wire rack to cool completely. Then cover and refrigerate the brownies until they are firm enough to cut into squares (several hours or even overnight). Once chilled, remove the brownies from the pan by lifting with the ends of the baking sheet and transfer to a cutting board. With a sharp knife, cut into 16 squares. It is a good idea to have a damp cloth nearby to wipe your knife between cuts. 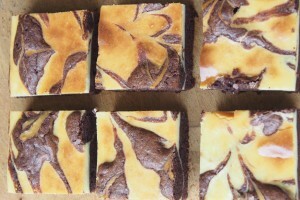 These brownies can be stored in the refrigerator for several days. Serve cold or at room temperature.